A dream realized through tradition and vision….Master Bouzouki artist, Alekos Galas came from humble beginnings, but his visionary dreams have brought his traditional instrument to new heights. Alex ‘Alekos’ Galas was born in San Francisco, California. His mother and father were Greek immigrants to the U.S.; his mother immigrated in 1948 and his father in 1952. As a youth, Galas played and practiced the Bouzouki for hours upon hours, learning by ear to play television show and movie themes, music from the radio, and of course, the traditional music of Greece. Alekos reminisces, “On one summer day, after practicing the entire day, it was getting late and my father asked me to stop since he and my mother were ready to turn in for the night. I asked permission to go to the garage in order to continue playing. Finally, I became tired and decided I’d better go to bed. To my great surprise, when I looked out the window, it was sunrise!” To this day, Alekos has the same passion about his instrument. It was becoming increasingly apparent that Alekos had found his destiny. Aware of his talent, his father bought records of Bouzouki artists and Alekos would learn note for note the many instrumental pieces. Galas’ father was very proud of him and at the age of eleven, he bought a Bouzouki that cost $600; very expensive for those years and considering the family was not wealthy by any stretch of the imagination. It was at 17, Galas began his professional musical career performing in major cities all over the United States and Canada. This spanned over 4 decades and included many concert appearances at Performing Art Centers and Concert Halls. Through the years, Galas recorded and featured the Bouzouki for many artists in the Greek music genre, as well as successfully crossing over into other genres of music, recording for different World Music projects, jazz fusion, and for pop & smooth jazz artists. He was privileged when asked by record producer and composer, Steve Wood, who has written the music scores for over 30 IMAX films, to play Bouzouki for the IMAX FILM, “GREECE: SECRETS OF THE PAST.” The soundtrack ended up winning the GSCA Award for best film score of 2006. Throughout his musical career, Galas has performed with top musicians and recorded for music projects of many genres. MEDITERRANEAN BREEZE is a project that is a culmination of experiences and ideas he has wanted to release for some time. His compositions are from his heart and soul; a musical expression of beauty, human emotions, and love. Music is his life, and for that reason, the compositions and performances of Alekos Galas undoubtedly reflect the passion and creativity of his life-long journey to not only bring his music to the masses, but to also infuse other genres with the beautiful sounds of the Bouzouki, which is clearly exhibited in his latest release, MEDITERRANEAN BREEZE. One of the most highly respected BOUZOUKI artists, Alex “Alekos” Galas is recognized and considered to be among the best BOUZOUKI virtuosos. A “world-class” musician, recording artist, composer and producer, Alekos Galas has established his musical achievements and recognition with a successful performing career spanning over four decades. 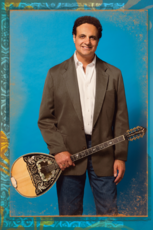 Playing the BOUZOUKI professionally since his early teens, Galas has played on numerous recordings for various artists and genres that include Smooth Jazz, World Fusion, and Jazz Fusion. He is noted for his technical mastery, dexterity and complex solos on the BOUZOUKI and is sought out as a session player which has included film soundtracks. A true fusionist, his new self-produced offering features Alekos in the leader role, with commanding performances and the introduction of a traditionally ethnic instrument reformulated in the hands of a master. The sound is beautifully translucent, introducing the listener to a modern sounding, texturally fused reverberation that is a groundbreaking recording. MEDITERRANEAN BREEZE takes the listener on an exciting and entirely enjoyable musical journey. This is a soulful, uplifting and melodic fusion of heart and instrument, highlighting the beauty and versatility of the Bouzouki. From the beginning notes of “Bouzouki Spice” the listener knows they are in the hands of an innovator. Alekos takes the listener on an expedition of technical prowess coupled with an array of original compositions that can be described as World Fusion, Smooth Jazz, and Pop; with elements and influences of Greek and Mediterranean music. “Moon Nights” offers the listener a wonderfully blended fusion of Smooth Jazz sounds and Mediterranean spice perfectly melded into a hybrid recipe that is guaranteed to satisfy the most exacting palate. “The Road Home” has an infectious beat that brings the release diversity and a nice texture change mid-way through the journey. Each cut is highlighted with evident chemistry between the players. This collaboration is augmented with notable and legendary musicians MARC RUSSO, ABRAHAM LABORIEL, ALEX ACUNA, each lending their unique musical voice and creating a release that engages the listener from the first notes. The most evident message throughout the release is the pure joy within each composition, the core foundation that propels each track to its full potential and climax. One listen and you will understand why Alekos has received much critical acclaim for his commanding, stylish performances. The journey ends with “Hidden Love,” an introspective and organic tune that is tender and heart-wrenching, a befitting closing and anthem to the prevailing message this wonderful recording has to offer. Drink in the sights and sounds and bask in the beauty of Mediterranean Breeze.